Apigee Edge includes several installed extension packages. Before you can use an extension in an API proxy with an Extension Callout policy, you'll need to add and configure the extension. 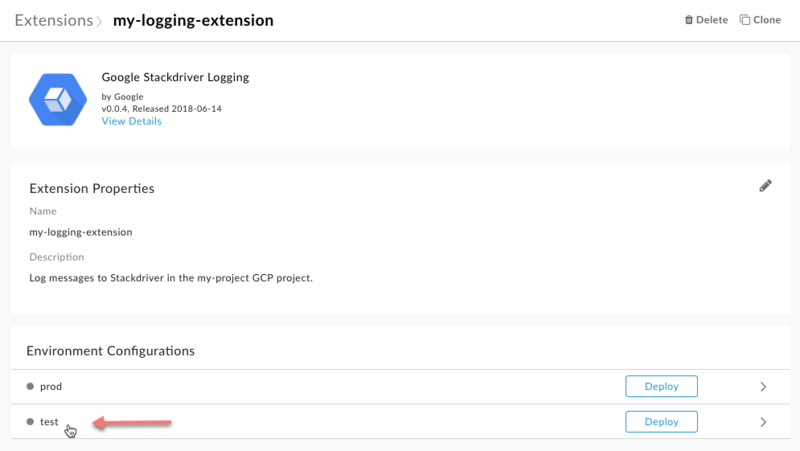 When you add an extension, you locate the extension package that represents the external resource you want to integrate with your API proxy, add and configure an extension from that package, and deploy the extension to an Edge environment. Note that you must be an organization administrator to configure an extension. When you configure an extension from an extension package, you specify values that focus the extension's interaction with its external resource. For example, when you configure a Google Cloud Firestore Extension, you specify which database the extension should use when creating, getting, and deleting documents. Each extension has its own set of configuration properties that correspond to aspects of the resource it interacts with. For a list of included extensions, see Extensions reference overview. Typically, each extension's configuration includes the credentials the extension should use to authenticate with the resource on your behalf. The extensions deployment environment is elastic to support autoscaling based on load. As a result, by default, an extension deployment that has no traffic may not have an available instance to respond to requests. So the first request to an extension may take longer while the environment creates an instance of the extension for use. For a tutorial to get started, see Tutorial: Adding and using an extension. Note: See you plan for any usage quotas that apply. In the New Edge experience, click the Admin menu, then click Extensions. The Extensions page that appears lists all of the extensions that have been configured from extension packages available on the system. If you wanted to view an existing configured extension, you could filter the list by typing filtering terms at the top of the page. In the Extension page, click Add Extension. The Select an extension page that appears divides the extensions between those that are developed by Google and those developed by other companies. Under Select an extension, click the tab you want, then locate the extension corresponding to the external resource you're accessing. In the box for the extension package, you can click View Details to view information about the extension's version, author, and so on. Click the box for the extension package to begin configuring an extension from the package. In the Extension Properties dialog box, enter a name and description for the extension, then click Create. 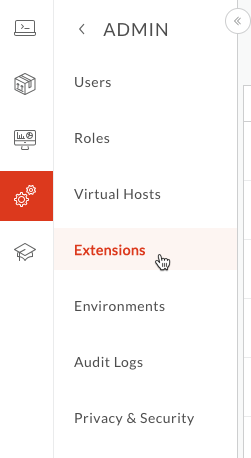 In the Extension > My-Extension-Name page for the extension you're creating, locate an Apigee Edge environment for which you want to configure the extension. An extension must be deployed to the same environment as the API proxy that will be using it. Click the environment's row in the list. In the Configuration dialog, select or enter values to configure this extension. Each extension has its own configuration properties. For descriptions of the properties, use the extension's reference. Extension references are listed in Extensions reference overview. In the Extension > My-Extension-Name page for the extension, click Deploy to deploy the extension for use from an API proxy. Add the extension to an API proxy using the Extension Callout policy. You can view log data generated by the extension. For more, see Viewing extension logs.